Home / What is Vibration Training? In its simplest form definition, vibration training is a training style in which the exerciser performs exercises while on a machine that vibrates the entire body. This concept is known as Whole Body Vibration (WBV). Vibration training was initially used in Space to prevent cosmonauts from having their bones and muscles degrade in zero gravity environments. It later expanded into the fitness industry, and further towards physical therapy, rehabilitation and professional sports. Vibration training is also currently being used for beauty and wellness applications. When one stands on a vibration machine, the entire body is exposed to vibration energy, as opposed to local vibration (Biomechanical Stimulation, BMS), where an isolated muscle or muscle group is stimulated by the use of a vibration device. The vibration generated from the platform travels up from your legs, and all the way to your head. These micro vibrations causes the respective muscles and muscle groups to involuntarily contract and relax, leading to a significant increase in muscle fibers recruitment when static poses or dynamic exercises are performed on these vibrating platforms. One very common use for vibration training technology is that vibration machines are able to deliver an effective weight loss regimen for people that find conventional exercises too painful, impractical, ineffective, or too time consuming. The effectiveness of conventional exercise for weight loss has been a major concern for many people. Gym-style exercises and weight lifting evolve around the concept of using large muscle groups, which are very effective in burning calories, but makes the body hungry for sugar, the body’s natural energy source. Large muscle groups uses sugar as the primary energy source, so this causes the person to develop an increased appetite, leading to weight gain if the excess energy is not well spent. Conversely, vibration training is focused on the use of the body’s involuntary fast twitch reflex muscle groups, which receive their energy from fat deposits rather than sugar. This results in quicker weight loss because the body does not need to refill its energy reserves from sugar after a vibration training session. 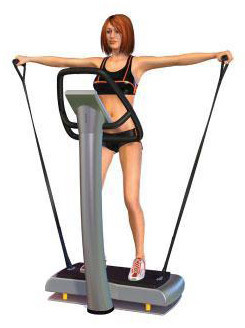 Another common use for whole body vibration machines is for people that are specifically looking at muscle toning and strengthening. Many professional and amateur athletes use vibration training machines to assist and amplify their training and give them a competitive edge. Typically these aspects of vibration training are better suited from the Triplanar (Vertical) style of whole body vibration machine. There are many types of whole body vibration but the two most popular are the pivotal (or oscillation) and triplanar (or lineal or vertical) types of vibration machines. The two different types of vibration use different approach to achieve different health goals. However, there are a few important factors to consider when choosing which vibration type to go for, and how your body responds to these types of vibrations. The frequency is measured in Hertz (Hz) and determines how many times per second the platform will complete an entire cycle of movement from bottom to top and back to the bottom again. Alternatively, it is how many times per second the muscles in your body contract and relax per second. The amplitude is measured in millimeters (mm) and determines the vertical distance the platform moves from the bottom to the top. 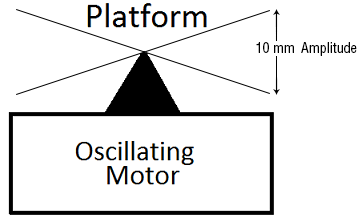 Oscillation vibration machines all have adjustable frequencies, but the amplitude is adjusted either stepping closer or farther away from the center of the platform. The further out, the higher the amplitude, and the stronger the vibration. Conversely, triplanar (or lineal or vertical) vibration machines have adjustable frequencies and amplitudes. Depending on these two variables, our body reacts and behaves very differently. A low amplitude and high frequency machine typically results in better strengthening results. A high amplitude and low frequency machine typically result in better weight loss and therapeutic capabilities. Numerous independent medical research has been very helpful in advancing Whole Body Vibration technology. In addition, large companies and institutions like NASA, professional sports team, and medical practitioners, are using Whole Body Vibration technology to assist their cosmonauts for space travel, improve their players’ performances, and to help their patients. The continual need to improve and enhance the well-being of everyday people will lead to ongoing improvements to vibration machines which will only solidify and add to the many benefits of whole body vibration training.